Carmarthenshire is situated in south west Wales and is part of the UK. 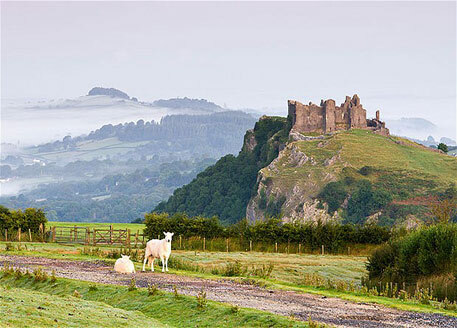 Carmarthenshire has fertile land and strong agricultural produce and is known as the ‘Garden of Wales’. South of Carmarthenshire is the Atlantic Ocean, where there are sandy beaches and fishing villages dotted along the coast line. Further inland are mountains and trails for climbing and walking enthusiasts. The rivers Cothi and Towy flow through Carmarthenshire and the rivers are well known for salmon and trout fishing. The principal industry is tourism, fishing, forestry and agriculture. Carmarthenshire has a population of over 175,000 the English language is widely used although approximately 40% can speak Welsh. Carmarthenshire is steeped in history stretching back to medieval time. There are ruins to explore, an 11th century castle, 13th century fortress, an underground passageway leading to natural caves which according to legends, during prehistoric times were inhabited. Carmarthenshire has an excellent education system from pre-school to 6th form and onto to university in nearby Cardiff and Swansea. There are excellent transport links with the M4 motorway and the A40 running through Carmarthenshire connecting to M5, M6, M42 and M50. Public transport has fantastic links to major towns and cities and local services connect Carmarthenshire to villages and suburbs outside of town. There is a local bus company, national coach companies and frequent train service all in operation from Carmarthenshire. Ferry links operate from nearby Swansea, Pembroke Dock and Fishguard. Cardiff International Airport is just over a 1 hour drive away with flights to Europe. Carmarthenshire is a thriving town and has a lot to offer so whether you are purchasing property for a holiday home, permanent living, or looking to invest in the ‘buy-to-let’ market, property investment in Carmarthenshire is an excellent choice.